There are several writings and letters that provide some 'colour' of family life and their community. Documents on this page are copywrited. No reporduction or quotations are permitted without the express permission of the webmaster. 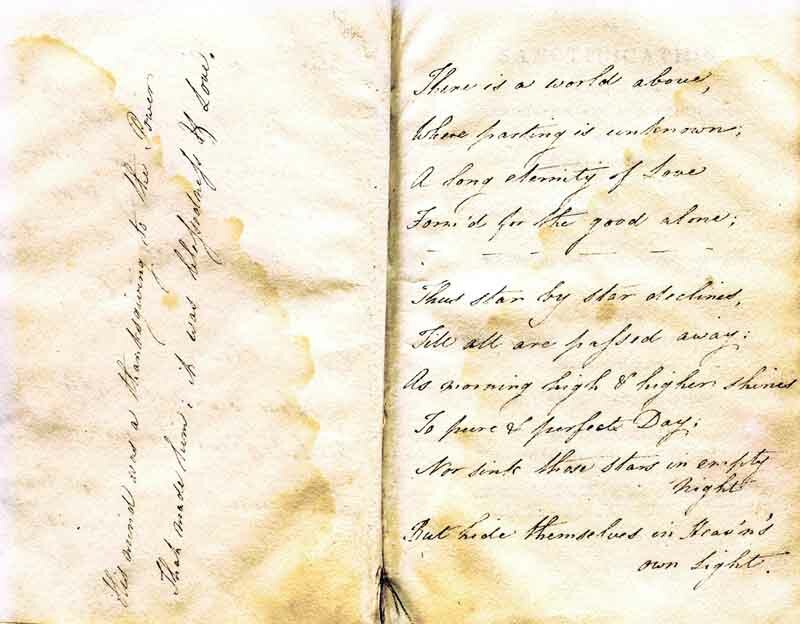 A short diary written by Jean-Lewis's wife Amelia Keir, covering events from 1819 to 1828, gives us a 'window' on their daily lives and some of her personal observations. She provides some insight into the family's activity in the anti-slavery movement. Amelia's Diary is a .PDF file and can be viewed in your browser if you have Acrobat Reader installed. There are many personal reflections including expressing her sadness that son John Lewis had chosen a career in the military and her anguish over his departure on November 20, 1826. John Lewis went to India with the 13th Light Dragoons and was probably struck down by a cholera epidemic that hassassed their encampment in the spring of 1828. Amelia aludes to this in a brief entry she made on May 29, 1828. John Lewis lies in the Protestant Cemetary at Pondicherry, India. 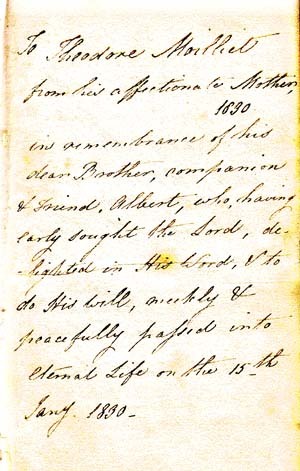 The entire document, 30 pages, stops short of recording her grief at the loss of John Lewis, in India and later the passing of her youngest son Albert (Alby) at the age of 13 in 1830. 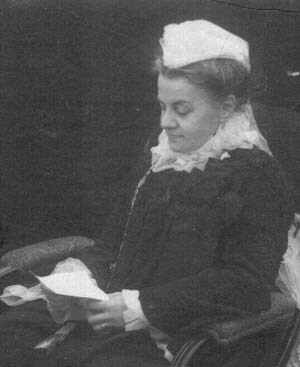 Upon Albert's death Amelia presented small New Testaments to family members. At least 2 of these she gave her son Theodore, who would have been 20 years at the time, and have been preserved. 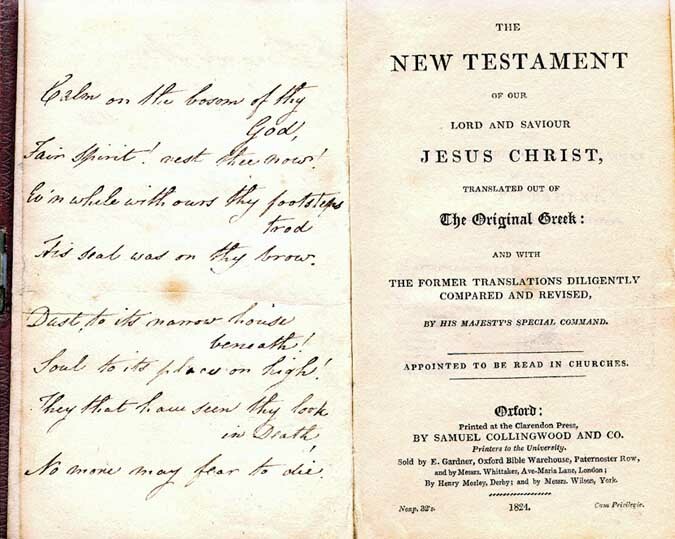 Here are scans of the first couple of pages in these Bibles. It reads, "To Theodore from his affectionate mother, 1830, in remembrance of his dear Brother, companion & friend, Albert, who having early sought the Lord, delighted in His Word & to do His will, meekly and peacefully pafsed into eternal life on the 15th January 1830". The poem. "Calm on the bosom of thy God, Faint spirit! rest thee now! Ev'n while with ours thy footsteps trod, His seal was on thy brow. Dust to its narrow house beneath! Soul to its place on high! They that have seen thy Lord in death, No more may fear to die." It reads, "To Theodore Moilliet, January 1830. From his affectionate mother in remembrance of his tender guidance of his young & dear brother Albert, & of the mutual & confiding love which grew between them." "Love is indistructable, its holy flame for ever burneth. From heaven it came, to heaven it returneth. His mind was a thanksgiving to the Power that made him; it was blefsednefs If Love." The poem, "There is a world above, where parting is unknown. A long eternity of Love, Form'd for the good alone. Thus star by star declines, Till all are pafsed away. As morning high and lightness shines to pure and perfect day. Nor sink those stars in empty night. But hide themselves in Heav'n's own light". 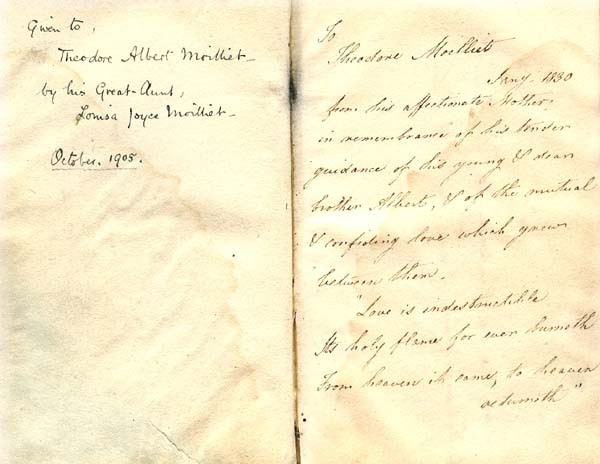 Both New Testaments were presented to Theodore Albert Moilliet, upon his returning to Canada in 1905 following the death of his father James Keir. They were given to him by Louisa Joyce Moilliet, 2nd wife and widow of Theodore. Emma Sophia was the youngest child of James and Lucy (Galton). In 1910 she recorded some of her reminiscences of her childhood years at Abberley and Prêgny. The Moilliet Family Tree chart has been drafted in Microsoft Excel. It only records the names of those family members that bore the name Moilliet. Thus descendents of Moilliet daughters are not shown. The file is 265K and prints a chart of 7 pages X 2 pages. Download Family Tree .XLS file. Read about the challenges of building a high range ranch in central British Columbia. John Keir Moilliet, son of Theodore Albert Moilliet who came to Canada at the turn of the century and carved a ranch out the B.C. 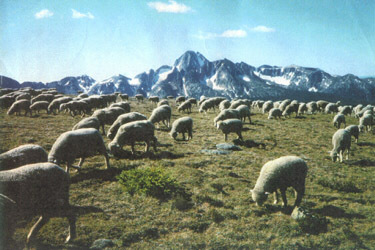 wilderness, describes many of the challenges of living close to the land and working with a large sheep herd. Be introduced to some of the colourful characters that lived in the North Thompson Valley and on Aveley Ranch. The story is 71 pages with b&w pictures in a 2.6 megabyte .PDF file.